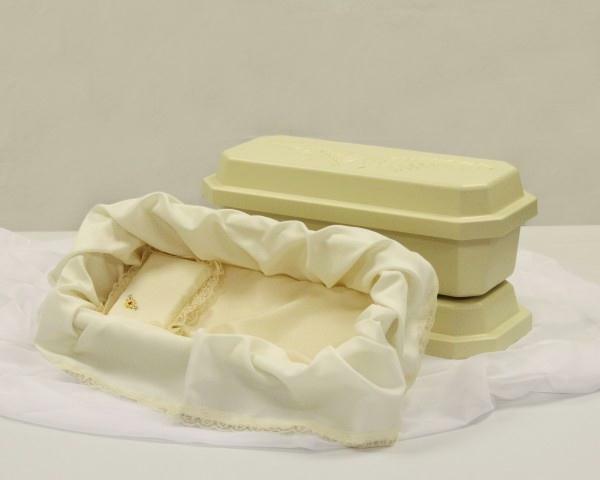 The Hoegh #20 Deluxe Pet Casket is built for lasting durability and quality. All units are constructed of strong, high-impact styrene. The design and special sealant restrict seepage of water and the intrusion of air. Hoegh pet caskets are capable of serving as a Casket-Vault combination. The #20 Deluxe is available in an almond colored exterior with a matching rosetan interior. The interior consists of a pad and pillow. The skirted pad and the pillow are trimmed generously with lace. The pillow is accented by floral applique. Inside Dimensions: 20" x 8" x 7.75"